Tabbakhian, M., Daneshamouz, S., Tavakoli, N., Jaafari, M. (2005). Influence of Liposomes and Niosomes on the In Vitro Permeation and Skin Retention of Finasteride. Iranian Journal of Pharmaceutical Sciences, 1(3), 119-130. Majid Tabbakhian; Saeid Daneshamouz; Naser Tavakoli; Mahmoud Reza Jaafari. "Influence of Liposomes and Niosomes on the In Vitro Permeation and Skin Retention of Finasteride". 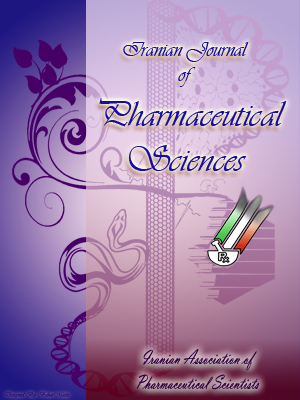 Iranian Journal of Pharmaceutical Sciences, 1, 3, 2005, 119-130. Tabbakhian, M., Daneshamouz, S., Tavakoli, N., Jaafari, M. (2005). 'Influence of Liposomes and Niosomes on the In Vitro Permeation and Skin Retention of Finasteride', Iranian Journal of Pharmaceutical Sciences, 1(3), pp. 119-130. Tabbakhian, M., Daneshamouz, S., Tavakoli, N., Jaafari, M. Influence of Liposomes and Niosomes on the In Vitro Permeation and Skin Retention of Finasteride. Iranian Journal of Pharmaceutical Sciences, 2005; 1(3): 119-130. In this work we sought to determine whether vesicles (liposomes/niosomes) were able to enhance finasteride concentration in the dermis layer, including the pilosebaceous units (PSU). Such enhancement could be beneficial in the treatment of some androgen-related skin disorders. Hamster flank skin was used to study 3Hfinasteride permeation via vesicles and a hydroalcoholic solution (HA). The drug-containing vesicles were composed of dimyristoyl phosphatidylcholine (DMPC) or egg lecithin: cholesterol: dicetyl phosphate (liposomes) and polyoxyethylene alkyl ethers (Brij ® series) or sorbitan monopalmitate (Span 40): cholesterol: dicetyl phosphate (niosomes) and were prepared by the film hydration technique. Determination of finasteride content by HPLC showed 80-97% drug entrapment efficiency in the vesicles. The amount of 3H-finasteride penetrated into and permeated through hamster skin 24 h after topical application of vesicles ranged from 5.5 to 13% of the initial dose, compared to 24%, observed with HA ( pSpan 40 and lecithin vesicles was lower, when compared with liquid-state Brij97, Brij 76: Brij 97 and DMPC vesicles. The fraction of finasteride found in the dermis layer was greatest where DMPC liposomes were used (7.8%). The vesicles significantly reduced drug permeation as indicated by the flux of finasteride from vesicles (0.025-0.058 µg/cm 2.h), where compared with the HA (0.13 µg/cm2.h), (pthe percutaneous absorption of finasteride and increasing its concentration and retention in the dermis layer. Skin disorders such as acne, seborrhea, hirsutism and androgenic alopecia are secondary to excess local activity of androgens, especially dihydrotestosterone (DHT), in the pilosebaceous units (PSU). DHT is formed from testosterone via the pivotal enzyme, 5α-reductase. The possibility to enhance the concentration of 5α-reductase inhibitors at the PSU, to alleviate the disease states associated with or originating from, has been implicated in a number of studies [1-4]. Finasteride is a known 5α-reductase inhibitor [2, 5-7] expected to be pharmacolog- ically active at the PSU. There have been several clinical studies on the efficacy of oral finasteride for the treatment of seborrhoea , female hirsutism [8-10] and androgenetic alopecia [7, 11-15]. Finasteride has also been used topically to treat androgenetic alopecia . Finasteride topical formulations, if provide sufficient drug concentrations at the PSU, would be advantageous over oral tablets, because of their reduced systemic side effects. In recent years, many attempts have been made to enhance drug deposition in the hair follicle and PSU using delivery systems such as nanoemulsions [17, 18], low-molecular weight dextrans , microspheres [20, 21], iontophoresis [22-24] and niosomes or liposomes [1, 17, 25-33]. Niosomes are shown to have some advantages over liposomes with respect to chemical stability, lower costs and the large number of surfactant classes to design these vesicles on demand [34-37]. Formulation factors like lipid composition and charge may affect skin distribution of drugs [28, 38-42]. The therapeutic efficacy of vesicular formulations can be affected by the physical state of vesicles [34, 43]; bilayers in the liquid state are not closely packed as in the gel state and penetrate more easily across the skin strata. Although finasteride is being used orally in the treatment of alopecia, and it has been used as a hydroalcoholic topical solution in a clinical study , its skin permeation and biological effects on PSU has not yet been reported in the literature. In this study, we sought to examine deposition of liposomes- and niosomes-encapsulated 3H-finasteride into the different strata of the Golden hamster flank skin. We also wanted to compare the skin permeation of finasteride via vesicles with hydroalcoholic solution. Therefore, we undertook some studies to determine the extent to which liposomes/niosomes containing finasteride promote permeation through or deposition into skin and the possible mechanisms involved. Non-ionic surfactants: Brij 72 (poly- oxyethylene 2 stearyl ether), Brij 76 (polyoxyethylene 10 stearyl ether), Brij 97 (polyoxyethylene 10 oleyl ether), Span 40 (sorbitan monopalmitate) and cholesterol (chol) were purchased from Fluka (Switzerland). Dicetyl phosphate (DCP) was obtained from sigma. Dimyristoyl phos- phatidylcholine (DMPC) was from Nippon Fine Chemicals (Japan). 3H-finasteride, having the specific activity of 25 Ci/mmole, was purchased from American Radiochemicals (ARC, USA) and finasteride was from CIPLA Inc. (India). Clobazam was kindly provided by Hakim Pharmaceuticals (Tehran, Iran). Hyamine hydroxide (ICN Biochemical) was used as a tissue solubilizer. Ready Value®, Ready Organic® and Ready Protein+® scintillation cocktail were obtained from Beckman (USA). Sephadex G-25 coarse was bought from Pharmacia LKB (Uppsala, Sweden). Egg lecithin, acetonitrile LC grade and methanol LC grade were obtained from Merck (Germany). All other chemicals and solvents were of analytical grade. HPLC- grade deionised water was produced using Direct-Q™ (Millipore, France). Male adult Golden Syrian hamsters (weighing 80-110 g), 10-12 weeks of age, were purchased from Pasteur Institute (Tehran, Iran). The animals were housed one per cage in plastic boxes on sawdust with tap water. The animals were housed at a photoperiod of about 14 h-light and 10 h-darkness and ambient temperature, for at least 2 weeks prior to the experiments. The skin overlying the flank organs was closely shaved with an electric hair clipper. The experiments using animals were approved by the university’s ethics committee. Multilamellar vesicles (MLVs) were prepared by the film hydration method as reported by Baillie et al. with some modifications. Lipid components of niosomes comprising one surfactant or two surfactants: chol: DCP (7:3:1, m.r.) or liposomes consisting egg lecithin or DMPC: chol: DCP (8:2:1, m.r.) were dissolved in chloroform: methanol (2:1, v/v). The total lipid concentration was 30 mM. Finasteride solution in the same solvent (0.53 mM) was spiked with 3H-finasteride at 8 µci/ml and added to the lipid solution in a round bottom flask. The solvents were removed using a rotary evaporator at a reduced pressure. The dried thin film was hydrated with PBS (pH 7.4) for 30 min at 10 °C above the phase transition temperature (Tc) of the amphiphiles while shaking. The dispersion was left for 4 hours at room temperature (RT) to complete hydration and then stored at 4 ºC overnight before use. The freshly prepared MLVs was first examined under light microscope (Leitz, Germany) and polarized light microscope (Olympus Optical Co., Japan) for the absence of any finasteride or cholesterol crystals or surfactant aggregates. The vesicle size distribution was determined by a Single Particle Optical Sensing (SPOS) method using Klotz® particle sizer (Germany). A Mettler TA 4000 (Germany) equipped with a DSC-30 measuring cell, was used for calorimetric analysis. The temperature and energy was calibrated by indium as standard. The niosomal suspensions were concentrated by ultracentrifugation (Beckman L5-50, 16,000 x g, for 30 min at 4 °C). Fifteen µl samples containing approximately 1.5 µmole lipid were placed in a small aluminum pan and sealed. An equal amount of PBS was placed in the reference pan. The niosomal samples were scanned at a rate of 5 ºC/min, in the 0- 80 ºC range. Transition temperature was defined as trace moves off the baseline in the thermogram, i.e. the onset of the transition (Tc) [34, 35, 45-48]. Finasteride and 3H-finasteride were dissolved in ethanol: propylene glycol: PBS pH 7.4 (56: 24: 20, v/v) in order to obtain a final drug concentration of 0.53 mM (and 8µci/ml activity). Full thickness of flank skin was excised from freshly sacrificed hamster with ether and its subcutaneous fat was carefully removed using scalpel and scissor. The skin was mounted on the vertical Franz diffusion cells (Ashk-e-Shishe, Tehran, Iran), with the epidermal side facing up (skin area of 0.502 cm2, receiver volume of 8.5 ml). The receiver chamber was filled with PBS (pH 7.4) solution and the temperature was maintained at 37 ºC. Forty µl 3H-finasteride liposomes or niosomes was applied on the hamster skin (n=3) and massaged for 2 min with a small glass spatula. All experiments were carried out under non-occluded conditions. Samples of 0.5 ml were withdrawn from the receiver chamber periodically and replaced with the same amount of PBS. The samples were mixed well with 5 ml Ready Value® liquid scintillation cocktail to produce a stable clear- phase gel. After 24 h, the donor compartment was carefully rinsed with 300 µl buffer (¥ 5). The excised skin was removed from diffusion cell and fixed on a board using pins, with the epidermal side up. The flank skin was processed into its respective strata as follows. Eighteen pieces of adhesive tape, 1.9 cm wide and about 6 cm long, were used to complete stripping the stratum corneum (SC); 3 strips to remove the surface SC, 7 strips to remove intermediate SC and 8 strips for inner SC. The amount of drug remaining in the deeper skin strata was determined in the residual of the full thickness skin. The tape strips were immersed in 5 ml Ready Protein+® scintillation cocktail for 72 hours at 37 ºC to dissolve the stratum corneum. To solubilize the tissue specimens, they were placed in Hyamine hydroxide (tissue solubilizer, ICN) for 48-72 hours at 37 ºC. The solution was mixed with 1 ml hydrogen peroxide (30% v/v), which was added drop-wise, incubated for 24 h at RT, then mixed with Ready Value® scintillation cocktail containing 0.7% glacial acetic acid, and again incubated at RT for 2 days before counting. The 3H-finasteride was determined using a liquid scintillation counter (Beckman LS 6500 scintillation counter, USA). Figure 1. Optical micrographs of finasteride-containing Brij 72:cholesterol:dicetyl phosphate (7:3:1, m.r.) niosomes prepared by film hydration method (Bar = 10 µm). The data is expressed as mean±SD. Statistical analysis was performed by the student “t” test or analysis of variance (ANOVA) followed by Tukey post Hoc test using SPSS 11.5 for Windows. The level of significance was taken at p-values < 0.05. All of the vesicles exhibited X-cross images under polarized light microscope, indicating the lamellar structure of the bilayer membrane. The mean area-number diameters (dAn) of MLVs ranged from 2 to 4.4 µm (Table1). Brij 76 formed discomes (large disk-shape vesicles) or MLVs where 20 or 40 mole% of cholesterol was included, respectively. Brij 72 formed polyhedral MLVs in a viscous gel medium (Figure 1). The entrapment efficiency (EE %) of finasteride in the recovered MLVs ranged from 80 to 97% (Table 1). Table 1. Physical characteristics of vesicles and in vitro study of 3H-finasteride deposition in and permeation through the hamster flank skin, 24 hours following the topical application of drug-containing negatively-charged liposomal/niosomal formulations and hydroalcoholic drug solution, using Franz diffusion cells. skin compartments and the receiver chamber of Franz cell. Niosomes prepared from saturated alkyl chains surfactants (e.g. Brij 76, Figure 2a) had a significantly higher Tc than the vesicles prepared from unsaturated alkyl chain surfactants of the same length (Brij 97), (35.4°C vs. 21 °C). The DSC of niosomes composed of the mixture of 1:1 mole ratio of saturated and unsaturated surfactants (i.e.,Brij 76:Brij 97) showed an endothermic transition at 21 °C and a trace change in the base line (Figure 2b). Brij 72 niosomes had an endothermic transition at 55.4 °C. Inclusion of cholesterol at higher concentrations (> 30 mole%) abolished the gel-liquid transition of span 40 and Brij 72 niosomes. Figure 2. Differential scanning calorimetric thermograms of finasteride-containing niosomes comprising: a) Brij 76:chol:DCP (7:3:1, m.r.) and b) Brij 76:Brij 97:chol:DCP (3.5:3.5:3:1, m.r.). Figure 3. Permeation profiles of 3H-finasteride through hamster flank skin after topical application of drug-containing negatively-charged niosomal/liposomal formulations and hydroalcoholic drug solution using Franz diffusion cells. Each point represents the mean ± SD (n=3). Mean percentage of 3H-finasteride determined in isolated hamster flank skin following in vitro permeation studies are presented in Table 1. The total amount of finasteride penetrated into and permeated through hamster skin 24 h after topical application of liposomes and niosomes ranged from 5.5 to 13% of the initial dose, compared to 24%, observed with hydroalcoholic solution(p< 0.05). The lower extent of drug permeation via MLVs may indicate that the lipid bilayers of niosomes/liposomes were rate limiting in drug permeation. Other reasons could be the size of vesicles and/or their Tc which may further contribute to impeding drug permeation. Similarly, Bernard et al. suggested that liposomes clearly delayed the drug permeation compared with solution but better localized the drug in the sebaceous structure (targeting effect of liposome). Deposition of finasteride into the stratum corneum (strips 4-18) was significantly higher via hydroalcoholic solution compared to MLVs ( p < 0.05). This could be due to quick fixation of finasteride to the stratum corneum following solvent evaporation. Moreover, ethanol is a very effective skin penetration enhancer . Deposition of finasteride into the stratum corneum (strips 4-18) was significantly higher via hydroalcoholic solution compared to MLVs ( p < 0.05). This could be due to quick fixation of finasteride to the stratum corneum following solvent evaporation. Moreover, ethanol is a very effective skin penetration enhancer . The topically applied formulation undergoes dehydration at the temperature of the skin, i.e. ~32 °C. At this temperature, niosomes made of Brij 52, Brij 72, Brij 76 (Figure 2a) and span 40 remain in the gel-state, whereas vesicles comprising amphiphiles of liquid-state nature, i.e. having the Tc < 32 °C, begin to melt (Figure 2b), resulting in the bilayer fluidization, and partial release of the amphiphiles from the bilayers. The amount of finasteride deposited within the different skin strata was lower from gel-state Brij 72 and Span 40 niosomes and lecithin liposome, compared to liquid-state Brij 97, Brij 76:Brij 97 and DMPC MLVs and also gel-state Brij 76 niosomes, p < 0.05 (Table 1). An explanation is that non-ionic surfactants of higher hydrophilicity (i.e. Brij 76 and Brij 97) appear to increase leakage of drug from the vesicles , which as a result improves delivery of lipophilic molecules. The fraction of finasteride found in the dermis layer, following application of different formulations, was greatest when DMPC liposomes were used. Low transition temperature and penetration enhancing effect of DMPC may account for this high drug deposition. Similar findings by Ganesan et al. indicate that although liposomes clearly do not pass through the skin, they do induce remarkably different permeation behaviors of solute entrapped within them. In order to administer finasteride via the topical route, a preparation is desirable which improves penetration into the skin, especially in sebaceous gland-containing zone, while reducing systemic absorption. MLV-mediated effect on finasteride permeation through flank skin is compared to hydroalcoholic solution in Figure 3. The cumulative amount-time profiles of finasteride permeation followed the zero-order kinetics (R2 > 0.84). The MLVs had a significantly greater retaining effect on finasteride compared to hydroalcoholic solution (ANOVA, p < 0.01). These results agree well with those of Weiner and co-workers  who reported that skin permeation of lipophilic active compounds was lower via liposomes than via solutions. The flux of finasteride from Brij 76, Brij 97 (t=3.3, p=0.028) and Brij 97 (t=2.1, p < 0.01) niosomes and DMPC liposome (t=2.2, p=0.08) was higher, where each compared with the flux of drug from gel-state Span 40 niosome using Student t-test. On the other hand, permeation rates of finasteride from gel-state Span 40, Brij 76, Brij 72 niosomes and lecithin liposomes were not significantly different (p>0.05) (Figure 4). Differences in effect on drug transport between the liquid-state MLVs and the gel-state vesicles may be explained by differences in skin-formulation interactions, i.e. either due to the extent of interaction between vesicles and the stratum corneum . The surfactant molecules of liquid-state nature are thought to permeate into the intercellular lipid bilayers, thereby reducing the crystallinity of the intercellular lipid bilayers and thus increase the permeability of these bilayers . In contrast, surfactant molecules forming rigid gel-state bilayers can not penetrate into the stratum corneum, and thus they are not able to induce a penetration enhancing effect . On the other hand, the packing nature of unsaturated fatty acids (i.e. Brij 97) can change the fluidity of SC lipid structure and facilitate the skin permeation of drugs [53, 54]. Thus, transfer of drug from the lipid bilayers of vesicles into skin can occur as long as the bilayers are in a liquid-crystalline state. There is a relationship between the penetration-enhancing ability of niosomes and their effect on the ultrastructure of SC. Hofland et al. using freeze fracture electron microscopy confirmed that adsorption of niosomes on the outermost layer of the SC by forming stacks of bilayers on top of the SC. On the other hand, lipid bilayer structure of the stratum corneum can be disrupted by the niosome and liposome formulations. Niosomes appear to have potential as a novel drug carrier system for both dermal and transdermal delivery of drugs . One important question is whether intact vesicles are able to penetrate into the stratum corneum or even into the deeper layers of the skin. Although it is generally believed that intact liposomes do not penetrate compact layers of the stratum corneum , the specific mechanisms of liposome action in the skin strata remain to be enlightened. The mechanisms behind the vesicle-skin interaction are still unclear. Vesicle disintegration in the sebum-filled hair follicles seems to be likely; however, intact MLVs may also enter and traverse the follicle duct. On the other hand, maintenance of drug- liposomal bilayers interaction in the hair follicle may also be possible . It is generally believed that the intercellular route may dominate during steady state penetration of compounds; however, it has been argued that the skin appendages (hair follicles, pilosebaceous and eccrine glands) may offer an alternative pathway for a diffusing molecule . Lauer et al. proposed a theory that upon dehydration, the liposomal bilayers may yield a fluid liquid-crystalline state in which bilayers containing drug can partition and pack into the follicular ducts that contain lipids. The MLVs had a significantly greater retaining effect on finasteride permeation compared to the hydroalcoholic solution (ANOVA, p < 0.01). Negatively-charged DMPC, Brij 97 MLVs and Brij 76: Brij 97 MLVs, all being in the liquid-state, facilitated the deposition of finasteride into dermis layer, when compared with hydroalcoholic solution. In contrast, vesicles composed of surfactants of gel-state nature did not enhance delivery of the drug to the dermis layer, possibly due to lower interaction with and lack of penetration into the skin dense layers. Therefore, phase transition temperature of amphiphiles used to prepare vesicles from may play an important role in permeation of drug through skin. More comprehensive studies are required to demonstrate the potentiality of this route of drug delivery. However, in order to truly ascertain the significance of follicular delivery, appropriate models and quantitative methods must still be developed. Greater understanding of the control mechanisms, which govern this complex structure, may accelerate rational design of hair follicle-specific drug delivery systems. This study was supported by grant number 79340 from Isfahan University of Medical Sciences. Lieb LM, Flynn G, Weiner N. Follicular (pilosebaceous unit) deposition and pharmacolog- ical behavior of cimetidine as a function of formulation. Pharm Res 1994; 11: 1419-23. Chen C, Puy LA, Simard J, Li X, Singh SM, Labrie F. Local and systemic reduction by topical finasteride or flutamide of hamster flank organ size and enzyme activity. J Invest Dermatol 1995;105: 678-82. Matias JR, Orentreich N. The hamster ear sebaceous glands. I. Examination of the regional variation by stripped skin planimetry. J Invest Dermatol 1983; 81: 43-6. Matias JR, Malloy VL, Orentreich N. Synergistic antiandrogenic effects of topical combinations of 5 alpha-reductase and androgen receptor inhibitors in the hamster sebaceous glands. J Invest Dermatol 1988; 91: 429-33. Bull HG, Miller RR, Stearns RA, Bakshi RK, Rasmusson GH. Mechanism-based inhibition of human steroid 5 a-reductase by finasteride: enzyme catalyzed formation of NADP-dihydro- finasteride, a potent bisubstrate analog inhibitor. J Am Chem Soc 1996; 118: 2359-65. 4-aza-5a-androstan-1-ene-3-one is an active site-directed slow time-dependent inhibitor of human steroid 5a-reductase 1. Biochemistry 1994; 33: 2291-6. Chen W, Zouboulis CC, Orfanos CE. The 5a- reductase system and its inhibitors: recent development and its perspective in treating androgen-dependent skin disorders. Dermatology 1996; 193: 177-84. Archer JS, Chang RJ. Hirsutism and acne in polycystic ovary syndrome. Best Pract Res Clin Obstet Gynecol 2004; 18: 737-54. Wong IL, Morris RS, Chang L, Spahn MA, Stanczyl FZ, Lobo RA. A prospective randomized trial comparing finasteride to spironolactone in the treatment of hirsute women. J Clin Endocrinol Metab 1995; 80: 233-8. Meidan VM, Touitou E. Treatment for androgenetic alopecia and alopecia areata. Drugs 2001; 61: 53-69.
with male pattern baldness. J Clin Endocrinol Metab 1994; 79: 703-6. Drake L, Hordinsky M, Fiedler V, Swinehart J, Unger WP, Cotterill PC, Thiboutot DM, Lowe N. The effect of finasteride on scalp skin and serum androgen level in men with androgenetic alopecia. J Am Acad Dermatol 1999; 41: 550-4. Shapiro J, Kaufman KD. Use of finasteride in the treatment of men with androgenetic alopecia (male pattern hair loss). J Investig Dermatol Symp Proc 2003; 8: 20-3. Kaufman KD, Olsen EA, Whitimg D. Finasteride in the treatment of men with androgenetic alopecia. J Am Acad Dermatol 1998; 39: 578-89. Mazzarella F, Loconsole F, Cammisa A, Mastrolonardo M, Vena G. Topical finasteride in the treatment of androgenic alopecia. Preliminary evaluations after a 16-month therapy course. J Dermatol Treat 1997; 8: 189-92. Lieb LM, Ramachandran C, Egbaria K, Weiner N. Topical delivery enhancement with multilamellar liposomes into pilosebaceous units: I. In vitro evaluation using fluorescent techniques with the hamster ear model. J Invest Dermatol 1992; 99: 108-13. Wu HL, Ramachandran C, Weiner N, Roessler BJ. Topical transport of hydrophilic compounds using water-in-oil nanoemulsions. Int J Pharm 2001;220: 63-75. Lieb LM, Liimatta AP, Bryan RN, Krueger GG. Description and definition of a transfollicular route of permeant for topically applied agents to human scalp skin. J Invest Dermatol 1995; 104:655. Rolland A, Wagner N, Chatelus A, Shroot B, Schaefer H. Site-specific drug delivery to pilosebaceous structures using polymeric microspheres. Pharm Res 1993; 10: 1738-44. Sumian CC, Pitre FB, Gauthier BE, Bouclier M, Mordon SR. A new method to improve penetration depth of dyes into the follicular duct: potential application for laser hair removal. J Am Acad Derm 1999; 41: 172-5. Green PG, Hinz RS, Kim A, Szoka FC, Guy RH. Iontophoretic delivery of a series of tripeptides across the skin in vitro. Pharm Res 1991; 8: 1121-7. Cullander C, Guy RH. Sites of iontophoretic current flow into the skin: identification and char- acterization with the vibrating probe electrode. J Invest Dermatol 1991; 97: 55-64. Burnette RR, Ongpipattanakul B. Characteriza- tion of the pore transport properties and tissue alteration of excised human skin during iontophoresis. J Pharm Sci 1988; 77: 132-7. Lauer AC, Lieb LM, Ramachandran C, Flynn GL, Weiner N. Transfollicular drug delivery.Pharm Res 1995; 12: 179-86. Lauer AC, Ramachandran C, Lieb LM, Niemiec SM, Weiner N. Targeted delivery to the pilosebaceous unit via liposomes. Adv Drug Deliv Rev 1996; 18: 311-24. Li L, Lishko VK, Margolis LB, Hoffman RM. Product-delivering liposomes specifically target hair follicles in histocultured intact skin. In Vitro Cell Dev Biol 1992; 28A: 679-81. Bernard E, Dubios J, Wepierre J. Importance of sebaceous glands in cutaneous penetration of an antiandrogen: target effect of liposomes. J Pharm Sci 1997; 86: 573-8. Niemiec SM, Ramachandran C, Weiner N.Influence of nonionic liposomal composition on topical delivery of peptide drug into pilosebaceous units: an in vivo study using the hamster ear model. Pharm Res 1995; 12: 1184-8. Weiner N. Targeted follicular delivery of macromolecular via liposomes. Int J Pharm 1998;162: 29-38. Balsari AL, Morelli D, Menard S, Veronesi U, Colnaghi MI. Protection against doxorubicin- induced alopecia in rats by liposome-entrapped monoclonal antibodies. FASEB J 1994; 8: 226-30. Li L, Lishko V, Hoffman RM. Liposome targeting of high molecular weight DNA to the hair follicles of histocultured skin: a model for gene therapy of the hair growth processes. In Vitro Cell Dev Biol1993; 29A: 258-60. Li L, Lishko V, Hoffman RM. Liposomes can specifically target entrapped melanin to hair follicles in histocultured skin. In Vitro Cell Dev Biol 1993; 29A: 192-4. Bouwstra JA, van Hal DA, Hofland HEJ, Junginger HE. Preparation and characterization of nonionic surfactant vesicles. Colloids Surf A: Physicochem Eng Aspects 1997; 123-4: 71-80. Lawrence MJ, Chauhan S, Lawrence SM, Barlow DJ. The formation, characterization and stability of non-ionic surfactant vesicles. S T P Pharma Sciences 1996; 6: 49-60. Manosroi A, Wongtrakul P, Manosroi J, Sakai H, Sugawara F, Yuasa M, Abe M. Characteriza- tion of vesicles prepared with various non-ionic surfactants mixed with cholesterol. Coll Surf B Biointerf 2003; 30: 129-38. Varshosaz J, Pardakhty A, Hajhashemi V, Najafabadi AR. Development and physical char- acterization of sorbitan monoester niosomes for insulin oral delivery. Drug Deliv 2003; 10: 251-62.
liposomes or in solution. Int J Pharm 1995; 126:235-43. Han I, Kim M, Kim J. Enhanced transfollicular delivery of adriamycin with a liposome and iontophoresis. Exp Dermatol 2004; 13: 86-92. Ogiso T, Shiraki T, Okajima K, Tanino T, Iwaki M, Wada T. Transfollicular drug delivery: penetration of drugs through human scalp skin and comparison of penetration between scalp and abdominal skins in vitro. J Drug Target 2002; 10:369-78. Touitou E, Levi-Schaffer F, Dayan N, Alhaique F, Riccierr F. Modulation of caffeine skin delivery by carrier design: liposomes versus permeation enhancers. Int J Pharm 1994; 103: 131-6. Touitou E, Junginger HE, Weiner N, Nagai T, Mezei M. Liposomes as carriers for topical and transdermal delivery. J Pharm Sci 1994; 83: 1189-203. Baillie AJ, Florence AT, Hume LR, Muirhead GT, Rogerson A. The preparation and properties of niosomes-nonionic surfactant vesicles. J Pharm Pharmacol 1985; 37: 863-8. Bonina F, Montenegro L. Comparison of different separative techniques in the quantitative determination of active compound enclosed in liposomal systems. Int J Cosmet Sci 1994; 16:183-97. Fildes FJT, Oliver JE. Interaction of cortisol-21- palmitate with liposomes examined by differential scanning calorimetry. J Pharm Pharmacol 1978; 30: 337-42. Ford JL, Timmins P. The use of thermal analysis in the study of liposomes. In: Ford JL, Timmins P, (editors). Pharmaceutical thermal analysis. Chichester: Elis Horwood Limited; 1989; pp.259-78. Montenegro L, Panico AM, Bonina F. Quantitative determination of hydrophobic compound entrapped in dipalmitoylphosphatidylcholine liposomes by differential scanning calorimetry. Int J Pharm 1996; 138: 191-7. Roberts MS, Cross SE. Skin transport. In: Walters KA, (editor). Dermatological and transdermal formulations. New York: Marcel Dekker, Inc.,2002; pp. 89-196. Ganesan MG, Weiner ND, Flynn GL, Ho NFH.Influence of liposomal drug entrapment on percutaneous absorption. Int J Pharm 1984; 20:139-54. Sarpotdar PP, Zatz JL. Percutaneous absorption enhancement by nonionic surfactants. Drug DevInd Pharm 1986;12:1625-47. Hofland HEJ, Geest R, Bodde HE, Junginger HE, Bouwstra JA. Estradiol permeation from nonionic surfactant vesicles through human stratum corneum in vitro. Pharm Res 1994; 11:659-64. Fang JY, Hong CT, Chiu WT, Wang YY. Effect of liposomes and niosomes on skin permeation of enoxacin. Int J Pharm 2001; 219: 61-72. Valjakka-Koskela R, Kirjavainen M, Monkkonen J. Enhancement of percutaneous absorption of naproxen by phospholipids. Int J Pharm 1998;175: 225-30. Weiner N, Martin F, Riaz M. Liposomes as a drug delivery system. Drug Dev Ind Pharm 1989;15: 1523-54.